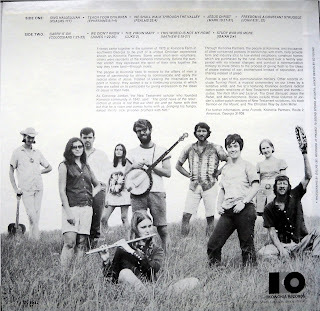 Admirable acoustic folk recording from male/female south-west Georgia outfit, a ministry of Koinonia Farm which emphasized social concerns and the “radical ideas of Jesus”. Simple earthy guitar and banjo sound covering spirituals and folk standards like ‘Teach Your Children’, ‘The Virgin Mary’, Woody Guthrie’s ‘Jesus Christ’, Tom Paxton’s ‘We Didn’t Know’, ‘This World Is Not My Home’, ‘Sing Hallelujah’, ‘Study War No More’ and ‘Freedom Is A Constant Struggle’. Nice authentic feel. A peace sign, a headband and a couple tie-die shirts are clearly visible amongst the group. Same label as Michael Kelly Blanchard’s debut as well as several “cotton-patch gospel” albums by Koinonia’s founder Clarence Jordan. (The Archivist by Ken Scott, 4th Edition).